With one quarter of the country protected as national parkland, Costa Rica is the perfect destination for the ecological traveler. From rainforest jungles to volcanoes to palm lined beaches, the stunning natural beauty and wildlife encounters exemplify the country’s motto- Pura Vida (Pure Life). Visit the rainforest region of the Arenal Volcano and stay near the beach overlooking the jungle. Experience hot springs, volcanoes, rainforest walks, swimming and snorkeling in the Pacific ocean. Flexible and responsive itinerary will be adapted according to weather and participant interests. Enjoy one on one companionship throughout the tour, with a certified genuine sister. The Costa Rica tour begins with a 3 night stay at the Arenal Observatory Lodge, situated within the Arenal Volcano National Park. Originally built as an observatory for the Smithsonian Institution, the lodge now offers visitors beautiful views of the Arenal Volcano, miles of trails through the rainforest, an observation tower, bird and frog habitats. Day one- After arriving at the airport, participants will rent a car and drive to Arenal. The afternoon will be spent in resting from the trip and acclimating to our surroundings. Day two- The day begins with a morning bird walk through the grounds of the Arenal Observatory Lodge with a local naturalist guide. The 2.5 hour walk will take us through the rainforest, over hanging briges, and past a waterfall, all while observing birds and animal life, which may include monkeys, iguanas, and sloths. The afternoon may include further exploration of the rainforest trails at the lodge, or a trip to the nearby Arenal Hanging Bridges Park. 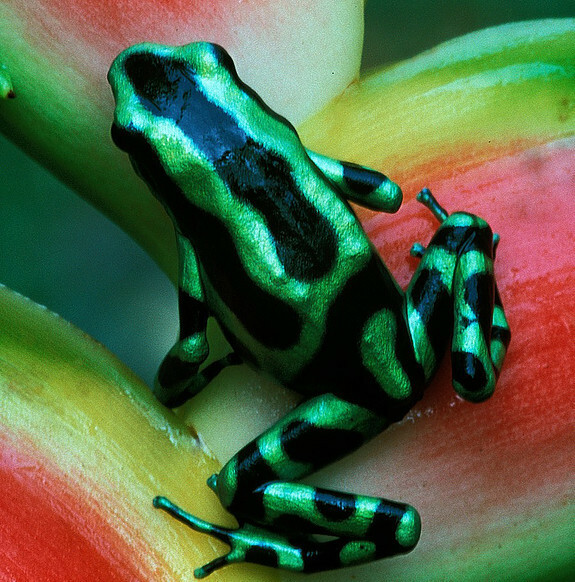 In the evening, get a close up view of the frog life with a nighttime frog observation tour. Day three- On our last full day in the Arenal region, we will explore the area driving through La Fortuna to the Eco Termales hot springs. This family run business offers bathers options ranging from 106 degrees to cool water springs. Enjoy a meal in the secluded garden setting at Eco Termales. Optional- For the adventurous traveler, an optional trip to the Tenorio Volcano National Park to view the turquoise waters of the the Rio Celeste may be arranged. Formed by a reaction of the chemical content of two rivers joining together, the day trip would include a hike out to view the convergence of the rivers, lagoons along the river and a spectacular waterfall. This optional adventure would entail remote driving conditions or joining a guided tour from the Arenal region and a rigorous hike through possibly muddy terrain. Day four- We pack our bags and depart our rainforest home for the Pacific Coast. Our five hour drive will take us along the Pacific Coast and past mangrove swamps. Traveling past the tourist destinations of Jaco and Quepos, we will make our way to a 100 year old Balinese teakwood villa overlooking the jungle and the Pacific Ocean. Day five- Our jungle villa is situated between several beautiful beaches. We will spend the day exploring the region, from Playa Matapalo and other nearby beaches. A waterfall on the property and a soaking tub on the balcony will complete our relaxing day. Day six- If our ramblings the day before led us to the perfect beach spot for swimming, snorkeling, beachcombing, and wildlife watching, we may return to yesterdays find. Alternatively, the day could include a trip to the popular Manuel Antonio National Park, where long sandy beaches, forest paths, and monkeys await. Day seven- We bid farewell to the Pacific Ocean, our jungle villa, and our monkey neighbors as we head back to San Juan and the airport. Enchanting but extreme alternative- Deep in the southern regions of the Osa peninsula, a wild and private bay on the Gulfo Dulce shelters the Finca de Nada. The open air cabin is accessible by boat, and visitors enjoy the seclusion of the jungle and their own private beach. The cabin comes with kayaks to explore the water, trails to explore the land, and the chance to enjoy the magic of bioluminescent plankton lighting the waters of the bay. This experience would add additional days to the trip as driving to the region would require extra time, and would require willingness to stay in a beautiful but very remote setting. Please note: This itinerary is a guide. Weather may affect our plans, and accommodations are subject to availability. Reserve soon to ensure accommodations. CONTACT SUSAN TO RESERVE YOUR SPOT. fees to parks, tours, and activities. Cost does not include meals or optional additional activities such as Rio Celeste tour or Finca de Nada. Additional days either in the rainforest or ocean jungle habitat can be added to the tour at approximately $200 per day.